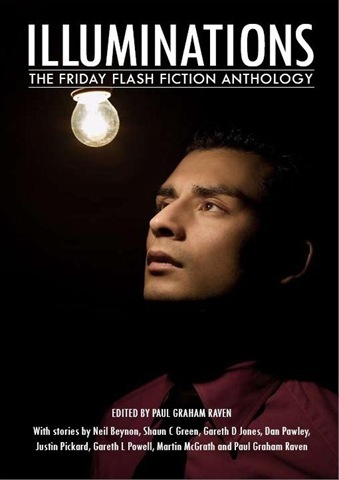 Along with Odd Two Out Publishing, I’m extremely pleased to announce that ILLUMINATIONS: The Friday Flash Fiction Anthology will be launched at Orbital 2008 next weekend. Regular readers will be familiar with the Friday Flash Fictioneers from Futurismic‘s free fiction round-ups. We’ve teamed up and collected over sixty of our best flash stories from the last nine months, and yours truly has edited them into ILLUMINATIONS, all profits from which will be donated to the National Society for the Prevention of Cruelty to Children here in the UK. ILLUMINATIONS is published under a Creative Commons Attribution Non-Commercial licence – the stories are already out there in the magical tubes of the internets, so we thought we’d like to set them free formally at the same time as making them available in one convenient and attractive package! ILLUMINATIONS will be available in book form from Odd Two Out Publishing after 25th March 2008 (or from the authors themselves) for GB£6.99, or as a downloadable PDF for an as yet unannounced price. The Friday Flash Fictioneers are Gareth L Powell, Gareth D Jones, Martin McGrath, Dan Pawley, Justin Pickard, Neil Beynon, Shaun C Green and yours truly, Paul Graham Raven. You can read the entire official announcement at Velcro City Tourist Board; I’ll be reporting any further developments here at Futurismic as well. And with the formal stuff out of the way, I’d just like to say that seeing my own name on the front of a book is probably the most amazing feeling I’ve had in my life so far!